Joy Creek Photo Archive (c) all rights reserved We found Clematis ochroleuca growing in roadside ditches in western Virginia. This clumping herbaceous perennial produces multiple stems, each bearing a single terminal flower. 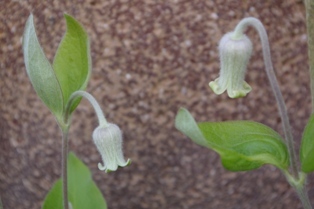 The nodding bell-flowers are cream colored and lightly hairy. Occasionally violet coloration in the stem will carry over into the base of the sepals. Give this good drainage. We are grateful to our friends the Chikumas for providing these treasures. All of our Clematis are two year old plants that are suitable for immediate planting in your garden. Late spring to early summer. 18-24 in. An herbaceous clematis. Cut back the old wood at the end of winter to clean up the plant.